A schematic of the M-19. Despite its great width and length, it was to be very flat, and mass only 500 tonnes. Image by the author, released to the public domain. Click for a larger view. What it was: The Ministry of Aviation’s candidate for a Soviet shuttle, an apparent attempt to wrest control of the Soviet crewed space program away from the Ministry of General Machine Building. It was a runway-launched, single-stage-to-orbit spaceplane using a hydrogen propellant-based nuclear engine, designed by the Myasischev bureau that had previously worked on the VKA-23. Details: After the first Myasishchev bureau was dissolved 1960 and many of its people moved to OKB-52, Vladimir Myasishchev didn’t lose his interest in spaceplanes. He became head of TsAGI, the Soviet experimental aviation bureau, then in 1967 was allowed to refound his own bureau, at which point he picked up from where he left off. A few years later the Soviet Shuttle project began, and Myasishchev was in the large camp of designers who were skeptical of the American design which slowly became the favorite behind the Iron Curtain. Many years earlier, responsibility for the development of rockets in the USSR had been disavowed by the Ministry of Aviation and fallen instead to the Artillery wing of the Red Army. When ballistic missiles and rockets became the glamorous thing in the late 50s the aviation types came to regret their decision and repeatedly tried to barge into the business—Vladimir Chelomei came from the aerospace side of things, for example. Now that the USSR was in the large, reusable orbiter business, the Ministry of Aviation chose Myasishchev’s new bureau as their new champion and set him to work. What the V. M. Myasishchev Experimental Design Bureau then proposed was a series of three craft, with several variations on each type, that would start with a high-speed test-bed and end with an orbital spaceplane. The middle craft was a reasonable knock-off of the NASA Shuttle, but the first and third were a radical alternative program. 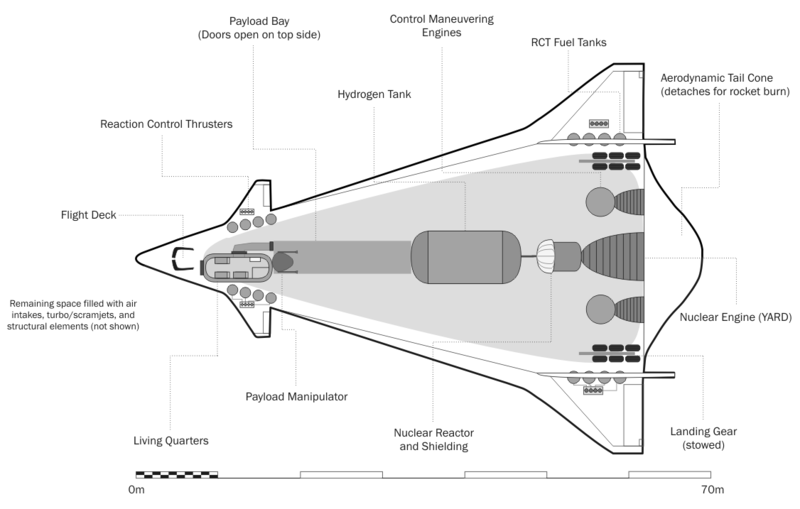 Back in the 1960s an engineer at NII-1 (“Institute of Jet Aviation-1”), Oleg Gurko, had come up with a novel concept for a SSTO, based around a nuclear reactor, the details of which we’ll explore shortly. His suggestion got nowhere in the 60s despite his approaching both Myasishchev and Mikoyan, representing the Aviation Ministry for which he worked. Once work began on the Soviet shuttle, however, the Aviation Ministry’s interest picked up and the Myasishchev bureau was told to work on a proposal based on Gurko’s idea. Myasishchev himself realized that this SSTO would be a massive leap that would take a long time to develop, but he was uneasy with merely copying the American shuttle as that kind of a project would only be completed several years after the United States was flying (as indeed was the case, with STS-1 occurring in spring 1981 and Buran’s one, crewless flight being in November 1988). If his country was going to be behind anyway, why not work on a project that would at least offer the opportunity to leap ahead during the delay? He reportedly summed up his approach as “Grab the problem by the throat and not the tail, or else you will always have the tail”. The breadth of Myasishchev’s ambition can be measured by understanding that the first plane in his program was not just a testing ground but, in order to bring the Ministry of Aviation on-side, was intended to double as an operational Mach 6 bomber flying at 30 kilometers up, twice as fast and fifty percent higher than the XB-70. The final plane was considerably more capable than even that. Weighing in at 500 tonnes with fuel, the M-19 was a very flat, 69-meter long triangular wedge with two small sets of wings, one at the tail and one as canards near the nose. Launching horizontally from a runway, the M-19’s trip to orbit would begin with twin turbofan jet engines burning liquid hydrogen. After getting up to Mach 4, the plane would switch over to scramjet engines, also burning hydrogen. In both cases, though, the engines had Gurko’s idea behind them for a little extra kick. The M-19 would have had a nuclear rocket engine that would take over in turn once the scramjet pushed the plane to Mach 16 and out of the appreciable atmosphere around 50 kilometers high. As the reactor was just sitting there during the turbojets’ and scramjets’ operation, Gurko reasoned, why not use it to superheat their exhaust to increase thrust? The potential increase in efficiency was considerable, and as the nuclear rocket (already more efficient than chemical rockets) would only be used for the final leg, the low inherent fuel use of the air-fed turbo- and scramjets gave the M-19 a tremendous payload fraction: the 500-tonne fully fueled plane was projected to lift 40 tonnes to LEO in its 15m × 4m cargo bay, which compares favorably to even staged rockets. Consider the Space Shuttle at 2040 tonnes and 28 tonnes of payload, or the Saturn V at 3038 tonnes and 118 tonnes of payload. To move whatever was stored in it, the bay was to be equipped with a manipulator unit, and an airlock from the crew compartment allowed EVA. Behind the bay was a large LH2 tank and, it should be made clear, no oxidizer tank. The rocket would run on raw hydrogen, while the two different types of jet would use the air as their source of oxygen. After completing its mission in orbit, the M-19 would then fly back home, using the same propulsion systems in reverse order to come into a powered landing at an airstrip somewhere in the USSR, with an astonishing cross-range capability of 4500 kilometers. 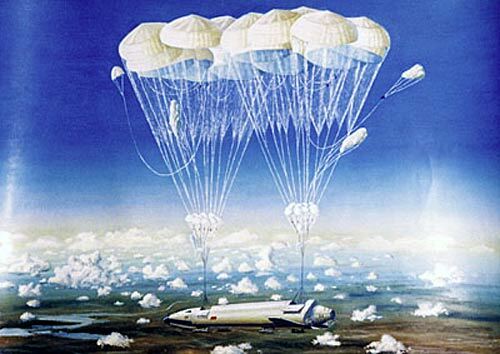 This completely plane-like return was of considerable interest to Soviet space planners for other reasons too, as it meant that the M-19 would reduce search and retrieval costs to nil as compared to capsules unless there was an emergency. Under those circumstances the cabin was to be entirely ejectable, serving as a survival capsule for the three to seven cosmonauts that might be on-board..
That the M-19 was perfectly capable of flying as an airplane in the lower atmosphere made it much more flexible too, as it could be moved to a different launch site relatively easily. And, as it didn’t drop stages on the way to orbit, it could be launched in any direction without worrying about what was downrange—a problem that’s particularly difficult for the USSR and Russia, and has led the latter to build its newest cosmodrome in the remote Amur region by the Pacific Ocean. Even in space the M-19 was unprecedentedly flexible, able to make repeated orbital plane changes by diving into the upper atmosphere and maneuvering aerodynamically. Whether performing an inclination change or coming down to land, the M-19 was protected by reinforced carbon-carbon (like the Space Shuttle’s leading wing edges) and ceramic heat tiles. The rocket for the M-19 was to be be built by the Kuznetsov design bureau, also the builders of the conventional engines for the N1, and would have been the first operational nuclear rocket in the USSR (and indeed the world). Testing beforehand would involve several flying test beds to develop hydrogen-burning engines and scramjets, drop test articles, and the aforementioned hypersonic test vehicle/bomber. Though Gurko himself did not work for the organization assigned to build the M-19 he consulted on it, and the M-19 gained the nickname “Gurkolyot” (“Gurkoplane”). If given the immediate go ahead, the Myasishchev Bureau predicted that the final craft would be ready for flight in 1987 or ’88. What happened to make it fail: First, Myasishchev’s bureau was absorbed again in 1976, this time into NPO Molniya, newly founded to make the Buran orbiter. The Soviet leadership had placed their bet on a close copy of the US’ Shuttle. Second, even Myasishchev called the M-19 his “swan song”, and that his ambition was to set the USSR on the right course, not see it through. He was in his seventies even before preliminary work began on the spaceplane, and his death in 1978 took away the program’s biggest voice. While some testing of a jet engine running on liquid hydrogen took place in 1988 (in the modified Tu-155 jet), and the first Soviet scramjet was tested on top of an S-200 missile in 1991, by 1980 the M-19 had receded into the future as a possible successor to Buran, rather than a competitor. Then the USSR came apart from 1989-91, and the future of the Soviet space program was forced into radically different channels. What was necessary for it to succeed: This is an awfully tough one to assess, as the M-19 is by some distance the most technologically sophisticated spacecraft we’ve looked at. It was based around so many novel approaches (a nuclear rocket engine, a scramjet, preheating the jets’ air, SSTO, and so on) that it seems impossible even with current aerospace technology. Scramjets and SSTO in particular are two things which seem to endlessly recede into the future as we come to understand how difficult they are. However, Myasishchev and his bureau acknowledged that it was a radical departure, that it would take a long time to develop, and that nevertheless they thought it could be done—and they were some of the best aerospace engineers in the USSR, if not the world. Who am I to say they were wrong? Even so, it does seem like they were. The problem was not an engineering one (even if I’m skeptical that anything like this could fly before the mid-21st century), but rather an economic one. The M-19 needed time, and the USSR had surprisingly little left. How to fix the economic mistake on which that country was based? There are convincing arguments that it could not be fixed, and that at best the Soviet Union could have lasted only another decade or two past 1991 while becoming increasingly pauperized year-on-year—hardly the best environment for cutting-edge aerospace research. The M-19 simply could not fit into the time remaining, even with any reasonable stretch in the USSR’s lifespan. Samoletoya EMZ in V. M. Myasishcheva, A.A. Bryk, K.G. Oudalov, A.V. Arkhipov, V.I. Pogodin and B.L. Puntus. Energia-Buran: The Soviet Space Shuttle. Bart Hendricx and Bert Vis. MASS schematic as shown in Transactions of the Eighth Symposium on Ballistic Missile and Space Technology (Vol. II). The launch vehicle was to be a Titan III, while the command module was based on research into lenticular missiles for the B-70 bomber. Public domain image via the USAF. What it was: A conceptual design for a manned satellite interceptor/killer, floated by General Dynamics in 1963. Details: The B-70 bomber was conceived to fly high enough and fast enough that it could out-run any possible intercepting aircraft, but before the program was well underway it became clear that surface-to-air missiles posed a problem, and that the USSR was good at building them. In December 1959 the USAF decided to build only one prototype (two were eventually built) for experimental purposes and that was that for the B-70. There was a short interval before cancellation where the USAF explored putting anti-missile missiles on board the B-70, under the unusual code name of Pye Wacket (probably taken from Kim Novak’s feline familiar in the 1958 supernatural comedy Bell, Book, and Candle). The B-70 flew at such great heights and speeds that making a conventionally shaped missile that could attack on any vector away from the craft proved to be problematic. The Pomona Division of General Dynamics assigned to the project instead settled on a lens shape for the body of the missile, which would make it more maneuverable than the conventional “long-and-thin” approach. When the B-70 was cancelled so was the missile project, but here the story of the MASS begins. Lenticular shapes were one of the three early contenders for manned spacecraft in the early American space program (along with ballistic capsules and winged re-entry vehicles) and Pomona Division got the idea to scale up the Pye Wacket body into something an astronaut could ride. This was written up and proposed to the USAF in March of 1961. There’s not a lot of public information about Pye Wacket, given that it was developed as a defense for a cutting edge nuclear bomber, and the larger manned, version was classified too: it seems to have been a dark horse running for the role proposed for the X-20. Much of what we know about the craft comes from a single unclassified paper called “Manned Anti-Satellite System” (MASS), published in October 1963, presumably because it had been definitively ruled out by then. The X-20 itself was cancelled outright in December of the same year. What General Dynamics proposed was a boost-glide craft, perched atop a Titan IIIC for the climb to orbit. It consisted of a 16-foot in diameter (4.9 metres), 8500-pound (3855 kilograms) lens-shaped command module, which seated three, and a 6200-pound (2812 kilograms) mission module, the latter of which would store a little over 7 US tons (6500 kilograms) of propellant—N2O4 paired with 50/50 hydrazine and UDMH. The most interesting part of the mission module was its “inspector/killer” modules, four of which studded the sides of the orbiting vehicle. These were protected during launch by “wind shields” or, in modern parlance, payload fairings. Once in orbit the fairings would be dropped and the craft as a whole maneuvered into proximity of a target Soviet satellite. At a standoff distance of 50 miles (80 kilometers), the crew would order one of the inspector/killers to detach and then it would close with the target using its two restartable engines. Each inspector/killer would be 47″ x 38″ x 38″ (about 1.1 cubic meters) when folded up, but once detached it would unfold a two-foot antenna so that it could send a video signal back to the command module, as well powering up a tracking radar with two antennas (one to lock on the target and one to lock on the command module), a TV camera, a flood lamp (in case the target was in the Earth’s shadow) and an IR detector. An I/K closes in for a an attack on its target, while the manned section of the MASS lurks at a safe distance. Public domain image from Transactions of the Eighth Symposium on Ballistic Missile and Space Technology (Vol. II). After inspecting the target, the crew of the MASS then had the option of detonating the shaped charge aboard the inspector/killer so as to destroy the target. As well as its two rocket engines, the I/K was outfitted with six attitude control motors, and using all of these it could even chase after a target that was designed to evade an attack; the I/K’s main motors could push it at 12g if needed. With up to four satellites destroyed, and potentially more inspected depending on how the targets’ orbits were arrayed, the command module would disengage from the mission module and return to Earth. Its lenticular shape allowed for a very high angle of attack (60 to 75º) to bring its ablative heat shield into play while still giving it a good lift-to-drag ration (∼2 as compared to the 1.0 of the Shuttle Orbiter). Once it was down to transonic velocity it would deploy two horizontal stabilizers/small wings, which were necessary due to the craft’s instability at these speeds as well; they also improved the command module’s L/D ratio considerably. What happened to make it fail: The MASS is a perfect storm of ideas that seemed promising in 1960 but that turned out to be dead-ends. Lenticular craft have never promised enough advantages to be built, the proposed customer—the USAF—never did get its own manned space program, and its proposed mission to intercept, inspect, and potentially destroy satellites has never been worthwhile in practice. In the X-20, it was also up against a strong competitor that had already got underway when MASS was proposed. What was necessary for it to succeed: It’s awfully hard to get this one to fly. Perhaps if Eisenhower hadn’t been so insistent on giving space to a civilian agency, and if the USAF had been able to fend off the Army to gain it for themselves (far from a foregone conclusion even in the absence of NASA), MASS might have moved further. Even under those circumstances we would have been much likelier to see something like the X-20 or the Manned Orbiting Laboratory rather than the MASS. When it comes down to it, this proposal placed bets on too many things that, in retrospect, never worked out. It’s interesting as a concrete example of how much we didn’t know in the early 1960s but, with the exception of the Project Horizon Lunar Base, it’s the least likely of all the post-Sputnik projects we’ve examined. On the other hand…for those of you who (like the author) enjoy stories about conspiracy theories, black projects, UFOs, and the like without actually giving them any credence, I’ll direct you to a strange Pye Wacket-related article published in Popular Mechanics’ November 2000 issue. It makes the case that the MASS wasn’t cancelled but instead went black and turned into a vehicle called the LRV. Fair warning, though: the words “Roswell”, “Nazi”, and “flying saucer” are used in all seriousness. “Manned Anti-Satelllite System”, E.E. Honeywell; Transactions of the Eighth Symposium on Ballistic Missile and Space Technology (Vol. II); Defense Documentation Center, Alexandria, Virginia; 1963. “Pye Wacket”, Mark Wade, http://www.astronautix.com/p/pyewacket.html. 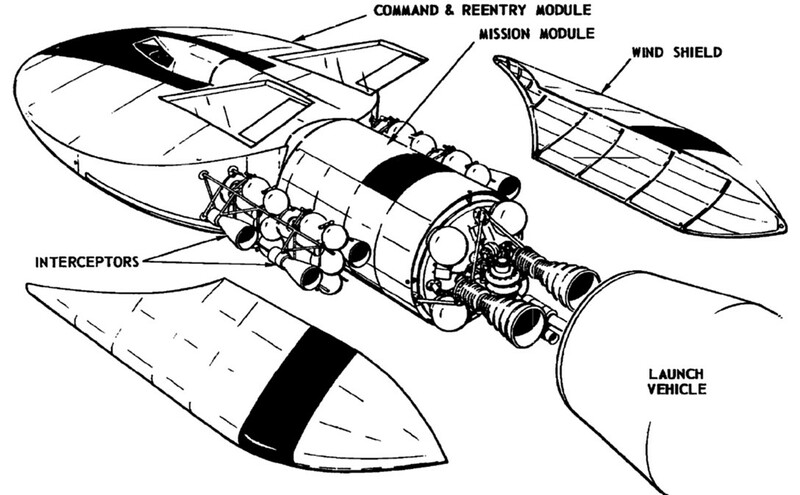 Schematic views of the MTKVP as first originally proposed (above) and as redesigned (below) in the first attempt to satisfy the Soviet military’s desire for a Space Shuttle analog. Image ©Mark Wade of astronautix.com, used with permission. For much more detailed (but unfortunately not free) images, visit buran.ru. What it was: A fairly sophisticated 1973-76 attempt to square the circle between the ballistic capsules favoured by Russian spacecraft designers and the Space Shuttle analog being demanded of them by the Soviet military. It would have been an elongated lifting body with a rounded triangular cross-section and small folding tail stabilizers. As designed it would have had a payload to LEO of roughly fifteen percent more than the US Space Shuttle. Surprisingly little information about this craft is available for something that was at the forefront of Soviet space development for nearly two years, and what there is is contradictory: the author even found four different names for it (MTKVP, MTKVA, MTC-VP, and MTK-AM) let alone a raft of inconsistencies in the project’s details. Much more than other False Steps posts this is an attempt to synthesize what’s available and may not be completely accurate. One presumes that only further discoveries in Soviet archives are going to bring this one into proper focus. Details: As discussed previously, the Soviet space program went through a radical reorientation between 1974 and 1976, as Vasili Mishin was removed as its head, the N1 rocket was cancelled, and the N1-L3 lunar landing mission was scrapped. While the new head Valentin Glushko was well aware that he was expected to focus on a reusable space plane and space stations in low Earth orbit, for eighteen months he entertained the possibility that he could satisfy the military and military-friendly backers who had allowed him to take over while still retaining the dream of a Russian Moon base (or, to be more precise, Glushko’s vision for how this would be done, Zvezda). The key difference he wanted was a big rocket booster that he could also use for Moon projects. Accordingly, what he supported was an effort to develop a reusable transporter without engines. This could be put on top of the booster, unlike the US orbiter, which needed clearance for its engines and had to be laterally mounted on the side of its rocket-and-fuel-tank stack. While initially conceived as a cylindrical body for cargo with a separable ballistic capsule on top for the crew return, it soon evolved into the MTKVP (“Reusable Vertical Landing Transport Craft” in Russian). In this new version of the craft the cylinder was replaced with a triangular prism with rounded edges. It tapered gently toward one end, where the crew cabin—now permanently attached to the vehicle—was located, while a single orbital maneuvering engine and small thrusters were placed at the other wider end. The aft end also sported two small winglets, which were folded up during launch and in orbit, but descended to give the MTKVP (in combination with its body shape, which was aerodynamic at hypersonic speeds) a bit of controllability. All told it had about 300 kilometers of cross-range capability, which in usefulness was its major negative compared to the American Space Shuttle. The booster which it would have topped was a variation on the largest rocket in Glushko’s proposed RLA series, the RLA-150 Vulkan. Dubbed the RLA-130V, it was a recognizable ancestor of the Energia rocket. The Vulkan’s upper stage was removed and replaced with the orbiter. That sat on top of a a large liquid-fuelled core (LOX and LH2) in the centre and six liquid-fuelled boosters around it; these burned LOX and syntin, an artificial hydrocarbon fuel developed by the Russians with better performance than kerosene. In contrast to the Shuttle, which lost its external fuel tank but had recoverable boosters, the launch vehicle would have been completely expendable. The main body of the MTKVP was dominated by an aft cargo bay, which like the American orbiter was protected by two long bay doors which could be opened to space. As it didn’t have to lift engines and full-fledged wings to orbit, it was to be capable of carrying some 30 tonnes of cargo to orbit, and bring back 20: more than the Space Shuttle, despite the disadvantage of being launched from higher-latitude Baikonur instead of Cape Canaveral. The MTKVP would have been about thirty meters long; some sources say 37 but this likely includes the mating adapter to its booster. In all it weighed 88 tonnes, which if you add on the 30 tonnes of cargo means the RLA-130V would have been lifting 118 tons to orbit—and if you noticed that that is similar in lift to the Saturn V and N1, congratulate yourself for finding the hidden Moon rocket. Image of the MTKVP coming in for landing, vertically. Image source and copyright status unknown, please contact the author if you know. Click for a larger view. Once it dropped below subsonic speeds, to Mach 0.75 at a height of 12 kilometers, it would demonstrate its other major difference from the Shuttle. The V in its name stood for “vertical” (in Russian, anyway) and instead of coming in roughly horizontally to a landing strip, it would deploy parachutes and descend vertically. At the last moment it would fire retrorockets on its underside and settle to ground on skid landing gear. So unlike the US’ orbiter it didn’t need a landing strip, and in fact didn’t need a prepared landing site at all. As long as the ground was flat—a common condition in much of the former Soviet Union—it could land pretty much anywhere. The first flight of the MTKVP was proposed for 1980. What happened to make it fail: The Soviet leadership—even Dmitri Ustinov, who had been one of his main supporters in his push to take over TsKBEM and transform it into NPO Energiya— made it abundantly clear to Glushko that they were not going to give him his Moon base, and that furthermore that they would not accept anything less than a close copy of the Space Shuttle. The psychology of the second part of this decision is interesting. 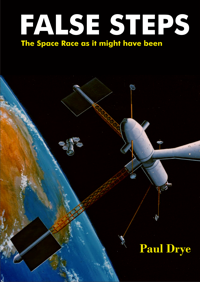 Interviews with the various players since the fall of the Soviet Union have established that in the years following the Moon race the Russians had a bit of an inferiority complex toward American space technology. Though their spacecraft designers could see no advantages to the Space Shuttle as compared to expendable systems like Soyuz and Proton, there ensued a battle between those who felt that their analysis should be read at face value and those who were sure that they were missing something. While the first of these approaches held the field for a while, the political and military people calling the shots became progressively more paranoid about what the Shuttle would be able to do and that the USSR was simply failing to see. Dmitri Ustinov in particular changed his tune after hearing from a shuttle enthusiast at NPO Energiya and from KGB Chief Yuri Andropov—one of the key believers in a hidden military purpose for the US’ orbiter. For their part, the spacecraft designers had realized there were a number of problems with MTKVP that they were not sure they could solve. Many of them could have been cracked: for example, it would have had to withstand 1900 Celsius on re-entry rather than the maximum 1500 of the Shuttle, but the tiles they later developed for Buran were within striking distance of this. Nevertheless two issues seem problematic even today. First, as it was designed to land virtually anywhere flat, there was always going to be the problem of how to get the MTKVP back to Baikonur for the next launch. Its low cross-range capability meant that it couldn’t always make it to an airstrip where railways or roads could be used to transport it, let alone something like the enormous Antonov An-225 used to carry Buran: it was by many measures the largest aircraft ever built and needed long, special-purpose runways. Furthermore the lack of cross-range capability made it hard to get the MTKVP back to Soviet territory in case of an emergency. The Space Shuttle could, if absolutely necessary, land in places as widely scattered as Gander in Newfoundland, Banjul in Gambia, and Guam. Russian insistence on secrecy ruled out this sort of emergency landing. Paradoxically, the USSR was both too big and too small—there wasn’t the necessary infrastructure in many places up-country where the MTKVP might land, and it was unable to be underneath every possible place where a crippled mission might want to land. Accordingly even as the MTKVP was being designed there was a portion of NPO Energiya working on something much closer to the Shuttle, the OS-120—which even had on-board rocket engines, meaning it was an even more slavish copy of the US orbiter than Buran turned out to be. It seems to have begun as a “due diligence” project, with Glushko far more interested in MTKVP because that approach would allow him his big booster. As pressure from the Shuttle advocates in the military increased, however, Igor Sadovksy (one of Korolev’s long-time engineers going back to the 1950s, and the man in charge of the OS-120) synthesized the two approaches by moving the engines off the orbiter and onto the rocket stack: in other words, the Energia superheavy launcher and the Buran shuttle. This gave Glushko his big booster and a way to satisfy the military and political forces pushing for a winged shuttle. On January 6, 1976 he approved the proposal, and work on MTKVP and the RLA-130V stalled and eventually stopped; in the future he would refer to this day as “Bloody Sunday”, as he realized it also meant the death of his Moon base plans for the foreseeable future. Buran’s huge costs would see to that. Glushko’s Zvezda base was allowed to move forward in a desultory fashion until 1978, but were cancelled outright then when Buran fell behind schedule and NPO Energiya was forced to work on it almost exclusively. What was necessary for it to succeed: There are actually a few different avenues that could have led to the MTKVP flying. A somewhat less-successful US Space program would have helped assuage the Soviet inferiority complex at the time and given them the confidence to go ahead with something more different from the American shuttle, rather than quite literally building an orbiter in which they did not see (but merely suspected) an advantage. The other way to keep it a going concern is to note one of the reasons Glushko submitted to “Bloody Sunday”. A movement was afoot by engineers who had worked on the N1 to propose the revival of that rocket to the Soviet leadership, and they were preparing to make their pitch in February of 1976. The MTKVP was relatively agnostic about the rocket on which it could be perched: there’d be no real difficulty in designing it to sit on top of an N1. Glushko’s pride couldn’t allow the resurrection of his rival Korolev’s dream booster after having advocated against it for more than a decade, so in part he chose to scrap the top-mounted orbiter in favour of a laterally-mounted Shuttle analog because there was no way to attach one to an N1. Give Vasili Mishin a successful flight of an N1 (perhaps due to a little more luck with the last failure in November 1972) and Mishin probably could have headed off the coup of 1974. The switch away from a Moon base and toward a Shuttle-of-sorts would have probably happened anyway, and the same engineers who developed MTKVP under Glushko would have been in place in this scenario. All other things being equal, they’d have ended up with a similar design, and would have had a boss who wasn’t beholden to the military people who wanted Buran. Under those circumstances we could have seen an MTKVP (or something quite like it) flying on Korolev’s superheavy instead of Glushko’s mooted replacement.